Gabriel lost one of his front teeth yesterday and now looks like a professional hockey player. Since we are in Costa Rica, we needed to make sure that we celebrated the event following the traditions in this part of the world. The tooth fairy is a fun tradition in most North American households, but in many parts of the world it's the tooth mouse that leaves treats behind for kids who've lost their baby teeth. For example, in Spanish-speaking countries, this character is called Ratoncito Pérez, a little mouse with a common surname, or just "ratón de los dientes" (Tooth Mouse). Last night, Gabriel prepared his tooth beside his bed with a note indicating that in exchange for his tooth, he would like “El Raton” to leave him $6 (we are not sure how he came up with that number). After the kids were fast asleep, we wrote up a note in English from “El Raton” and then used Google Translate to convert it to Spanish (we are pretty sure that the translation was likely not very good but we could always pass it off that the mouse has poor writing skills). 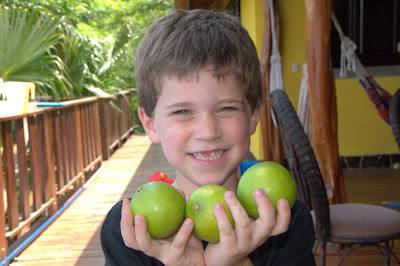 When Gabriel woke up, he was ecstatic to find a little over 1600 Costa Rican Colones in coins stacked up in the spot where he had left his tooth. For those of you familiar with the current exchange rate, that’s not quite $6 but the big, heavy Costa Rican coins are more exciting for him than the familiar Toonies and Loonies.